Cheddar Chive Scones these savory scones come together quickly and are delicious with eggs and bacon or just by themselves. 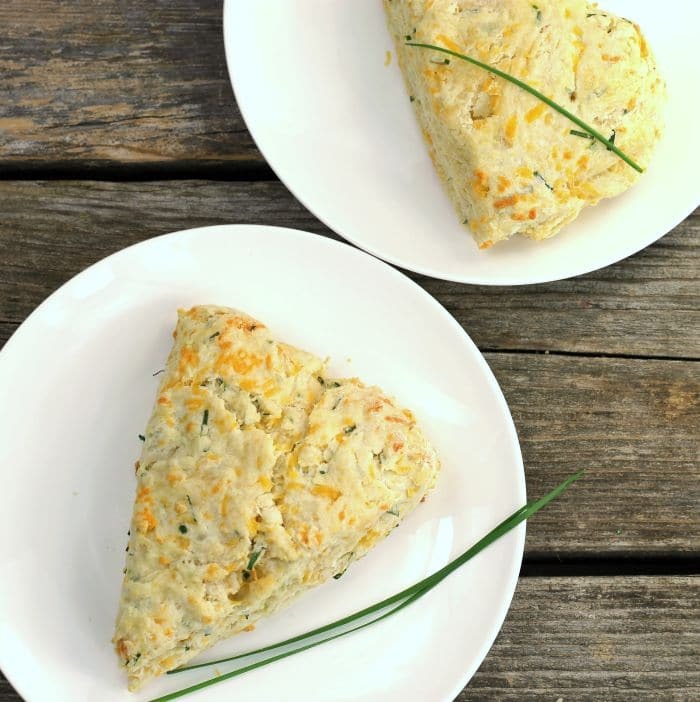 These cheddar chive scones are not your everyday scone, but they are made with fresh chives and shredded cheddar cheese. If you look around my blog you will see many scone recipes. Yeah, in my family I am known for the scones that I make. It is really kind of funny because before I started this blog I had never made a scone in my life and to tell the truth had never eaten on. I am not really sure how I even got started making them, but I was in love with them after I made my first batch. I have always made scones with fruit or sweeter versions, this is actually the first savory scone recipe that I am sharing on my blog. 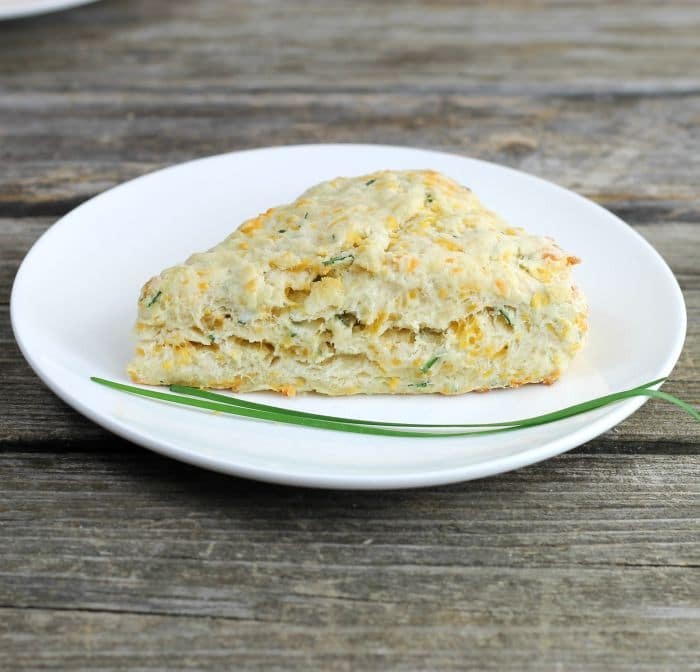 To be honest with you I am really loving these cheddar chive scones, they are perfect for eating all by themselves or serve them with eggs, bacon, ham, or hashbrowns. The summer is flying by and I have been trying to use herbs from my garden and the chives that I have planted were perfect for these scones. Should you use cold butter for scones? Yes, it is best to use cold butter in scones. When you use cold butter the butter does not blend completely into the dough instead it breaks down into small pieces. As the butter melts in the hot oven it creates steam that helps produce flaky layers. Sift together the flour, baking powder, sugar, salt, and chives. Cut the cold butter into 8 pieces. Using a pastry cutter or a fork cut in the butter. 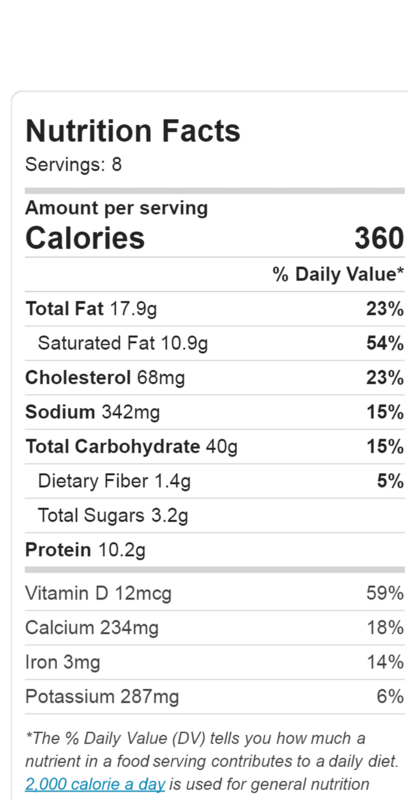 Mix in the shredded cheese. Combine the egg and milk together and add to the flour mixture. Mix just until the wet ingredients are incorporated. On a floured surface pat the dough out into an 8-inch circle. Cut into 8 triangles. Place the scones on a prepared pan and bake for 12 to 14 minutes or lightly browned. 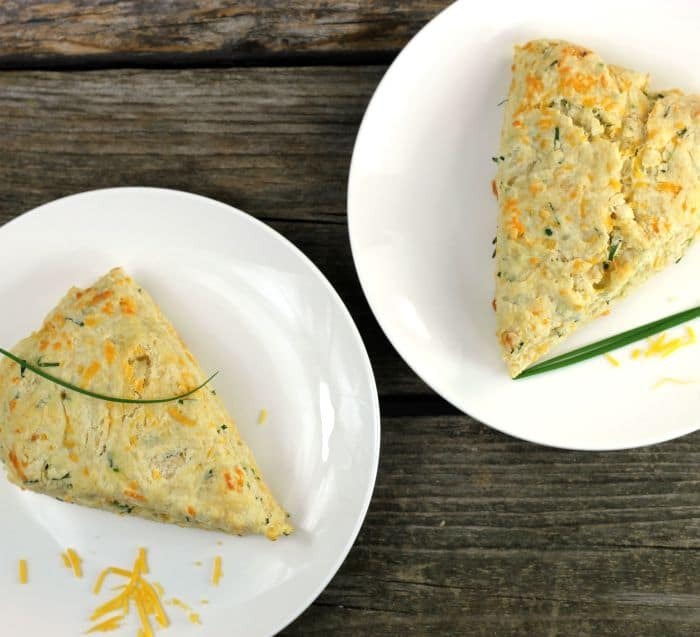 wow These savoury scones look marvelous with cheddar and chives! You’re definitely the scone queen. Hard to believe you never made them before you started blogging! Anyway, terrific looking recipe — thanks. These are some great looking scones, bet they’re delicious! I need to try making scones again and this recipe will work. Thanks! Hi Dawn. I love using chives in mine too. Such excellent flavour. Yours look wonderful!!!! These scones look perfect, Dawn! Next thing I know, you’ll be opening up a scone bakery. Haha! Like you, I had never really made scones until I started the blog…but now they’re part of the baking repertoire. I love the crispy little bits on the top! 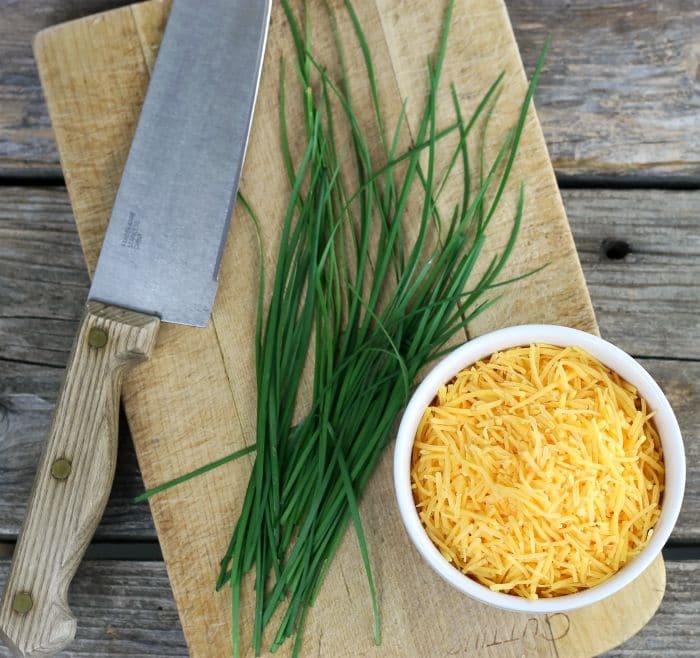 And great use of chives here, too!